Some of you may own or have seen the E-Z Angle ruler. It is a great tool! It allows you to use the same strip for your squares as well as your triangles. What a time saver! Without this ruler, you have to cut two strips. 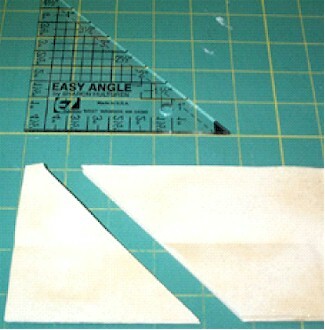 For example, if you cut your strip 3 1/2" for your squares, you would also have to cut strips 3 7/8" for your triangles. #1. 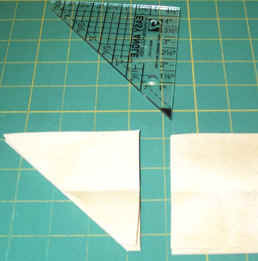 Decide what size strip you need to cut for your squares and your triangles. I cut my strips 3 1/2". Cut the squares you need to cut. Notice the ruler is placed along the bottom of the strip with the 3 1/2" line along the top of the strip. Cut along the edge of the ruler. #2. Rotate the ruler and turn it upside down. 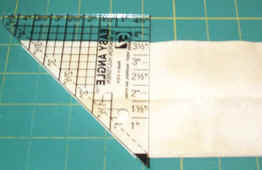 Place the ruler on the strip, with the tiny black triangle along the bottom edge of the strip. The 3 1/2" line is along the top edge of the strip. Cut along edge of ruler. #3. To cut the next triangle, repeat Step #1. This ruler is a fast and easy way to cut triangles and squares from the same strip.